Summer Was Put on Hold for Two Weeks! Sure the sun was out, but it was night-time in Hong Kong and that meant time spent indoors, biting fingernails...and trying to find out which television channel the equestrian sports were on (if they ever did get shown). For those with updated computers and browsers, live-streaming on the Internet was the answer. Maybe they should turn the jumping finals into a speed round? If a jumpoff for today's individual show jumping is required, it could be a test just to keep the rails up without a horse anywhere near! The reason? Typhoon Nuri is speeding toward Hong Kong and is expected within hours. It will pack winds of over 100 miles per hour and will certainly wreak havoc with the departure schedule from the airport. 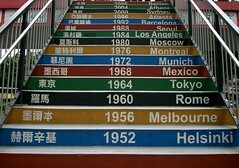 Olympic officials estimate that the jumping will be able to be completed...just in the nick of time. Typhoon Nuri killed four people in the Philippines this week. They say that competing in the international arena builds character. And sometimes, it turns out, your strength of character can prepare you for the international arena. To prove that point, after yesterday's individual dressage freestyle, the press was silent when they heard a touching story that none had imagined was transpiring over the past few weeks at the Hong Kong equestrian encampment. Emma Hindle of the British dressage team revealed last night that her Olympic appearance was little short of miraculous. "Two weeks before I came here I had an operation for a tumor," she explained to the stunned assembled press. "I could only ride in walk when I arrived in Hong Kong and Lancet was brilliant! Usually he's difficult when you are getting on and off him, but he seemed to know I wasn't well and he just stood there for me for a change." Emma, who lives and trains in Germany, only discovered the presence of two ovarian cysts during a team check-up and was advised to undergo surgery right away, Olympics or no Olympics. But, she shared, with extraordinary support from the British team she still made her Olympic appearance. "I had lots of help with my horse. People kept saying 'we believe in you, you can do it'. But it took a huge effort from the team and a lot of physiotherapy and work in the gym to get me going again," Hindle pointed out. "Everyone was so positive and so kind, I'm really proud of my horse and proud of my friends. When you are sick you find out who your real friends are, and many of my rivals turned into my best friends," she said. One of her greatest supporters was Princess Nathalie Zu Sayn-Wittgenstein who, last Saturday, helped Denmark to team bronze. "She rode Lancet every day (for me). She lives four hours away from me and she's a really good friend," the rider pointed out, and one of Emma's other great supports was her Irish groom, Niamh Meehan, who stayed with her at the hospital and who was there when the rider was informed that she had been selected for the British team. Emma ended up finishing seventh in the individual and was also the highest scoring British rider in the team dressage competition. British team leader Will O'Connell confided that the initial tumor was 8 centimeters long. "During a routine pre-selection medical, it was suggested she went for further tests," he said. "They found a tumor in her ladies region which measured about eight centimetres. The Monday after Rotterdam she went in for an operation to remove said tumor and with the help of family, friends and the support staff set about getting ready in just a matter of weeks for the Games. Some six weeks to the day, she cantered up the centerline here. "Emma’s achievement is what being an Olympian is all about – conquering adversity to produce a series of personal bests is an inspiration to any athlete. She has been quick to praise her back up team and the doctor Peter Whitehead and Physio Andy Thomas for the work they have done to make her recovery a fast one but also to her family and friends for their help and support." Thanks to the FEI and Will O'Connell of Team GBR for help with this report. The Hero of Horses: Orlov Trotter Balagur Goes from Circus, to Police...to the OLYMPICS! Someone, quick! Call Disney! Here's a horse worthy of their next animal film! He was bred to be a trotter, but didn't make it as a racehorse. He's performed in the circus ring. He's been a police horse. But a dressage rider spotted him in a parade and thought he might make a good dressage prospect. Meet Balagur, currently in fifth place in the individual dressage competition and within striking distance of a medal that he so richly deserves. Ridden by Russia's Alexandra Korelova, the pair were the early leaders in today's event. Many people will be watching the finals on Tuesday just because of this horse. The Russian dressage horse Balagur is the only Orlov Trotter in the Olympics. Orlov Trotters are usually thought of as carriage horses. They're not supposed to be in the Olympics. Balagur and Alexandra were trained in Germany by George and Monica Theodorescu. And this is his second Olympics! Click here for an excellent background article on Balagur and the Orlov Trotter breed. "Wir Sind die Goldenen Reiters!" The Germans Were Singing Loud Last Night! Hinrich Romeike (center, with medals) and Ingrid Klimke (red shirt) and the German eventing team were singing, "Hey, hey, hey...we are the golden riders" at their victory party after winning the gold medal. The German dressage magazine St. Georg has a little collection of photos (of which this is one) from the party. You'll feel like you are there...and wonder a bit about what's on Mark Todd's buttocks! Click here to check out their party shots. © 2008 by Fran Jurga, WorldRides and Equisearch.com. All rights reserved. To leave a comment or contact the author, click on the “comments” link in the tool bar below. One little town in Wiltshire, England can claim that almost one percent of its residents are Olympic athletes! What might really throw you, though, is that they are there representing three different countries! Great Cheverell, population 588, may have more horses than people. It is the home of Lucinda and Clayton Fredericks, who won the silver team medal in eventing...for Australia. Their training center, called Rosegarth, is home to 30 horses that they or their students are training. One of the Fredericks' students is Alex Hua Tian, the first eventing competitor ever from China; he is a student at Eton College. Great Cheverell is also the home of British dressage team rider Jane Gregory who rode yesterday in the team dressage. Willeke assists defending gold medal holder Anky Van Grunsven as she schools alone in the dark. Anky's teammates have scored highly in today's competition, but The Diva and Salinero don't do their grand prix for the team dressage medal until tomorrow. The Dutch press is reporting the dressage scores frenetically, the country is on edge...and dressed in orange, of course. Will history repeat iself? Willeke hopes so. The groom has become elevated to a national celebrity's status back home. And it's legitimate: the young girl is responsible for an excitable and extremely fit equine athlete with all the potential in the world. Photo courtesy of Anky, whose media machine is amazing. I've never seen an athlete do such a great job of staying in touch with her fans. I think she wants my job! Portofino 63 will not have many fond memories of the Hong Kong equestrian games. The British Olympic Association (BOA) and the British Olympic Equestrian Team have decided to withdraw her for veterinary reasons. Ridden by Michael Whitaker, Portofino is bothered by a lameness problem. The team veterinarian has carried out an extensive investigation but as yet has been unable to target the source of the problem. Portofino 63, a 16.3hh, 14-year-old bay Dutch mare, was sound during pre-export quarantine in the UK and on arrival in Hong Kong but has developed a problem in the last 48 hours. It has been decided in the horse’s best interests to withdraw her before the Horse Inspection for show jumping, which takes place tomorrow morning. Portofino was bought from the United States specifically with an eye to representing Great Britain in FEI-level competition. The reserve horse, Russel, ridden by Nick Skelton, now comes into the squad of four. Owned by Lisa Hales, Russel is a 16.2hh gray Holsteiner stallion. The Hinrich Manuever: How Many Gold Fillings in Two Gold Medals? Ask Hinrich! Germany's Hinrich Romeike is a dentist who trains his horse at night after work. A gold medal. Now there's something you can sink your teeth into! Two gold medals? All in an evening's work for the night rider from Germany. Tonight's show jumping finals for the eventing at Hong Kong were held under the lights, so Hinrich Romeike and his horse Marius felt right at home. The story of the 2008 Olympic gold individual medal is all the more extraordinary for the fact that Hinrich, who lives in Schleswig Holstein, is only an amateur. By day his time is spent in his dental clinic attending to his many patients so his riding is restricted to after-hours. "I ride after work, about 6 or 6:30 p.m." he explained, "I'm lucky because I have a few horses and I have a great groom to help me." So how does a part-time 44-year-old rider manage to beat some of the greatest professionals in his sport in the world? "I don't know the answer to that" Hinrich replied, "I just do it." He knows he has been gifted in his partnership with the magnificent gray Holsteiner, Marius. "He is the one who did it today, I didn't ride well. My horse never makes a mistake, but I make many... today however not too many!" he added. And he was thinking about his family and friends back in Germany. "Tonight they are in my surgery with a big flat-screen TV watching this all happening and they will be drinking champagne--so why are we sitting here drinking water?" he quipped to the delight of his listeners. The double gold medal winner is a charming man whose story can be taken to heart by many, many amateur riders. Well done, Hinrich! Thanks to the FEI for assistance with this post. Anky had plenty of time to look around the arena while she schooled Salinero in the rain last week. Dutch dressage diva Anky van Grunsven sent home an email to her Dutch fans that says a lot. As previously reported, Anky has been out in the pouring rain and scorching sun to school Salinero in the main arena. She has written home about the scary video screen, the misery of riding outside during a typhoon, and through it all, she makes it clear that she OWNS that arena. Salinero's hooves will know every inch of it by the time the grand prix begins on Wednesday. So she tells the story: The roofs on the huts were all a handsome, equestrian-ish green. But in Chinese custom, a green roof on a house means that the woman of the house is guilty of adultery. As we say in America, "Who'd have thunk it?" Apparently, you just don't paint even a gazebo with a green roof. So out came the crews with paint cans. The roofs are now gold. Salinero has two days to get used to the new color. Belgium? In second place? In Eventing? Nestled between Australian and German high-powered team efforts lies Karin Donckers, the individual rider in eventing for Belgium. You may remember Karin's spectacular fifth place finish at the 2007 Rolex Kentucky Three-Day Event. Ahead of her were Clayton Fredericks on Ben Along Time and Philip Dutton on Connaught. Both of those pairs are behind her today. Most Americans couldn't find Belgium on a map of Europe. Maybe they know about Belgian chocolate. Or Belgian draft horses. Or they remember their World War II history and the Battle of the Bulge. Modern-day European politics are centered in Belgium; the capital city of Brussels is the seat of the European Union's government. I suppose that, yes, the sprouts come from there, too! But what does this tiny country mean in the big picture of international equestrianism? Belgium has a long history of high performance results. Squashed between Holland and Germany as it is, how could it not be a hot bed of top riders? Olympics gold medal winner Rodrigo Pessoa, who rides for his native Brazil, has his training center in Belgium. There must be a reason! Let's look back in Olympic history: The nation’s riders won two of the four gold medals awarded when equestrian events were held for the first time during the second Olympic Games in Paris in 1900. The medals were awarded in the categories of jumping, long jump and high jump. Wouldn't you love to see THAT on videotape? In 1920, when the Games were held on home soil in Antwerp, Belgian riders had their best-ever medal tally---two golds, a silver and two bronzes. By this time, the equestrian program had been expanded to include Dressage, Eventing and Vaulting. (vaulting was on the program for the first and only time, like the high jump and the long jump were in 1900). More recently, the country has encountered harder times, and its riders have not been on the medal rostrum since the 1976 Games in Montreal, when they won a team bronze and an individual bronze. But the Belgian equestrian fraternity is not disheartened. “We have been regular competitors at the Games, and while we haven’t been able to win a medal since Montreal we have gone close several times,” said Belgian official Mr Ingmar De Vos. “We may have finished just out of the medals, but we have been competitive, recording two fourths in Athens, a fourth in Sydney and a fourth in Barcelona,” he stressed. Mr De Vos, Secretary General of the Belgian Equestrian Federation and leader of the Olympic equestrian team, said that while Belgium has not been able to qualify for the team events in Hong Kong, he is is optimistic the country’s top riders can qualify for the individual events in all three disciplines, and be medal prospects. He said among these riders are Jos Lansink, the current world champion in Jumping; Karin Donckers, who has a good record in Eventing; and Jeroen Devroe, who has been impressive in Dressage. We interrupt this blog to bring you the Rolex commercial! While this Rolex commercial is not directly linked to these Olympics games in Hong Kong, this one will take your breath away! Don't forget to watch the re-cap of the cross-country phase of the eventing tonight (Monday) on the Oxygen network (cable access required) from 6-8 p.m. Eastern time! I won't talk about the standings in X-C until after that, other than to say that the Swedish horse did suffer a hairline fracture and will be sent to surgery back at Sha Tin. The horses have all been moved back there to prepare for the show jumping finals tomorrow. Mary King is an anchor of experience and talent for the British eventing team. Great Britain's Mary King began riding in her fifth Olympic Games eventing competition when she entered that dressage arena today. That's as many as Andrew Nicholson and Mark Todd. It's one more than Karen O'Connor. Mary is without a doubt one of the world's leading event riders and also one of the most consistent. If you need any more proof, look at the leaderboard after two days of dressage: Mary is in ninth place overall, she was one of the very last riders to go, and she's the only Brit in the Top Ten. This woman doesn't like to stay home. She made the team and helped Britain win the European eventing championship in 1995...by not letting on that she was five months pregnant!! I'd like to ask you to go to the web site of the web site of the British newspaper, The Independent, and read a terrific interview with Mary King by the journalist Brian Viner. It's not often you see such a piece in a newspaper about an equestrian--or any sports figure, really. This is more like a magazine feature and it is very well written. Mary comes through with flying colors, much as she will probably do tomorrow when she goes cross-country with Call Again Cavalier. CLICK HERE to read this four-star article about one of the sport's great heroes. Cheer for Mary King! There was disappointment for Chile's Ricardo Stangher and Brazil's Fabricio Salgado when their horses – Literal and Butterfly – failed to pass the first veterinary inspection for Eventing horses at the Olympic core venue at Sha Tin in Hong Kong this afternoon. There was also a nervous moment for British fans when William Fox-Pitt's ride, Parkmore Ed, was dispatched to the holding area for closer examination. A noticeable girth gall had attracted the Ground Jury's attention but, after some deliberation, Technical Delegate Giuseppe Della Chiesa, Ground Jury President Martin Plewa and Jury Members Marilyn Payne and Christian Landolt declared the 15-year old Irish-bred gelding fit for action along with the other 69 horses from 24 nations. In an interview with the British newspaper The Independent, Fox-Pitt's teammate Mary King detailed how the British eventing team horses were rugged up in fleece while in quarantine to accelerate their sweating and recovery response time. She said that they would be using extra-fine blades to clip the horses. The problem with that is, of course, that the thin coat of hair has a tough job not becoming inflamed when martingales, breast plates and girths chafe on the tender skin. A girth gall is complicated by the limitations faced by the vet team in treating the problem, since many standard medications and topical products contain banned substances, such as salycilic acid. A girth gall is more challenging on an event horse, which has to go up and down hills and stretch its front legs out to land over banked obstacles. The horse can't be thinking about a nagging sore behind its elbow, it can only be thinking about its balance and stride. There was a real buzz of excitement in the air as the riders turned out smartly, many in specially-designed national uniforms, for this critical stage of the Eventing discipline but a hush descended when Fox-Pitt was asked to take his horse to the veterinarian in the holding box. Parkmore Ed did not appear lame so there was great interest as onlookers debated what might be amiss. However the veterinary officials and Ground Jury were simply attending to the most important element of equestrian sport -- the welfare of the horse -- and having noted the wound were keen to ensure that it would not be a cause of discomfort to the equestrian athlete over the next few crucial days of Olympic competition. Fox-Pitt explained afterwards that the gall had occurred following training a few days ago and that he had avoided riding Parkmore Ed more than was absolutely necessary over the past few days in order to allow the skin condition to heal. According to the official report from Team GBR, the irritation is on the horse's belly and is what is called a hematoma, or blister. Fox-Pitt conferred with Jenny Hall (the Team Vet) and Yogi Breisner (the Team Manager) and then with the ground jury, who did not ask to have the horse trotted again. There was an emotional moment for American rider Karen O'Connor also as she trotted-up the nine year old gelding Mandiba who earned a place on the US squad following the late withdrawal of Heidi White's team contender Northern Spy. Karen's hugely popular little pony, Theodore O'Connor, died tragically recently and was thus denied the opportunity to display his undeniable brilliance at Olympic level. But, as fate would have it, his rider has found her way to Hong Kong by other means and she will be sure to honor Teddy's memory with a good result despite Mandiba's relative inexperience. Many of the horses were in "look at me!" mode this afternoon as they pricked their ears and extended their stride before the officials and spectators, and the riders will be hoping that this same magical quality will be on display when they ride into the arena to execute their dressage tests over the next two days. Dressage begins in the state-of-the-art arena in Sha Tin tomorrow and continues on Sunday before the Eventing action moves to Beas River in the New Territories area, about 30 minutes away, for the cross-country phase on Monday. The medals will then be decided by the two final rounds of Jumping – one for team medals and one for the individual honours – on Tuesday night. Thanks to the FEI communications office for information in this post. It's too hot to train outside, but Anky van Grunsven is doing it anyway. The Dutch diva of dressage writes home that she is pleased that her horse and the other Dutch dressage horses have not shied at the huge video screen. But she knows that it is important to get her horse accustomed to the thing. "I.P.S Salinero did not look at all at the big screen," Anky writes enthusiastically to her fans. "The main arena is quite impressive, especially while the big screen is turned on but all Dutch horses were brave and trained very well." Anky is no shrinking violet. Even in the face of a typhoon, she schooled outside last night, as the storm subsided. "I rode in the rain but I had a lot of space as the other riders trained inside!" Anky wrote. The Dutch horses were among the first to arrive, and the other horses may still be getting used to the heat in Hong Kong. "Inside" means the huge indoor arena that is designed just for schooling and pre-event warmup. It is massive...and air-conditioned. Misting stations have been set up around the stable area so the horses can cool off as needed. Eventers will begin dressage competition in the big outdoor arena, with the screen, on Saturday. More bad news from Hong Kong: The rain in Spain is laced with pain. Make that pain in the leg. Faberge's leg, to be exact. The lovely dressage mount of Spaniard Beatriz Ferrer-Salat has gone lame. She withdrew on Thursday, leaving the Spanish riders short one team member. Apparently, they will now compete as individuals. All thumbs are up as world-class eventers Frank Ostholt (Germany), William Fox-Pitt (Great Britain) and Karen O'Connor (USA) share confidence and enthusiasm with CCTV. In the next few weeks you will see lots of clips from CCTV on this blog; it is the English-language international television network, roughly like our CNN or MSNBC. Thanks to "OlympicHeroes" friends for their help with this video. FIT TO COMPETE? First Vet Inspection for Eventers in Hong Kong in a Few Hours! The inspection begins at 16.00hrs (4:00 p.m.) local time in Hong Kong on Friday. That's means it will be happening before most of us in the USA are even up on Friday morning. Let's hope they are all sound. Belarus, New Zealand, Poland, Canada, Denmark, Russia, Czech Republic, Chile, Belgium, Germany, Italy, Austria, USA, Australia, Ireland, China, Sweden, Japan, Jamaica, The Netherlands, Great Britain, Switzerland, Brazil and France. Oh, mon dieu. Zut! Pas mal! And all those other French euphemisms we learned in school. Another top horse and rider combination has been forced to withdraw from the Olympics. French event rider Jean Teulere won't be trotting his horse up for the ground jury tomorrow when the vet inspection begins for the Olympic eventing competition. Espoir de la Mare had aggravated an old ligament injury back home in France but was believed to be recovered so he made trip, the FEI reported today. French Chef d'Euipe Thierry Touzaint said that the leg flared up again last weekend during a gallop. He said that the injury is not major and that the horse will probably compete again. 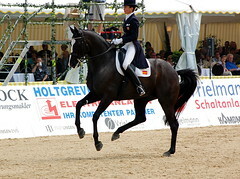 Teulere and Espoir won the individual gold medal at the World Equestrian Games in Jerez, Spain in 2002, along with team gold and individual fourth at the Athens Olympics in 2004. The French team will now be Eric Vigeanel and Coronado Prior, Nicolas Touzaint with Galan de Sauvagere, Jean Renaud Adde with Haston D'Elpegere and Didier Dhennin with Ismene du Temple. This narrationless video was spliced together by the Hong Kong Jockey Club so you can all see how the horses are off-loaded from the cargo "stall" containers and immediately transferred to waiting air-conditioned horse vans. You know, when I saw that music video for the German team, I immediately thought: Next week, just watch, dressage diva Anky van Grunsven will have a hip-hop song on MTV. So far, no performances from the Germans' archrivals in dressage and showjumping, the always-orange Dutch. But the Olympics has officially not even begun! Anky did share this poster, which apparently is adorning walls all over Holland, as well as Salinero's empty stall at home in Erp, Holland. The Telegraaf is advertising that it has all the news from Beijing (and presumably, Hong Kong). "Hup, Salinero, Hup" parodies Anky speaking to her #1 grand prix mount, Salinero. And the orange? Well...everything in Holland is orange, especially when the country's honor is at stake in international sporting events. You can always pick the Dutch team supporters out of the crowd...they're orange! Here's a little Dutch television news video of the US show jumping team in quarantine in Europe at the facility of Roel Koopmans. If you don't speak Dutch, just wait for Authentic and Beezie Madden to come on screen, or catch some glimpses of Laura Kraut's Cedric. Roel seems to be very entertained by his American guests; I hope he remembers that these women are defending the gold medal won by the US team at Athens in 2004! The U.S. team will be traveling to Hong Kong to participate in the show jumping events that commence on August 15 and run to the end of the Games. The European web site Eurodressage.com is reporting that French rider Karen Tebar has withdrawn her Hanoverian mare Falada from their place on the French Olympic dressage team. The withdrawal was announced from French quarantine headquarters in Aachen, Germany. 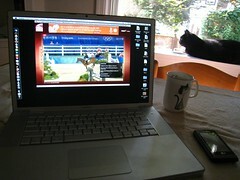 As you have surely read in the main news section of Equisearch.com, the US dressage team also had a withdrawal. First alternate Leslie Morse withdrew Kingston and was replaced by Michael Barisone on Neruda. The US eventing team also lost a key horse and rider combination when Heidi White and Northern Spy withdrew.